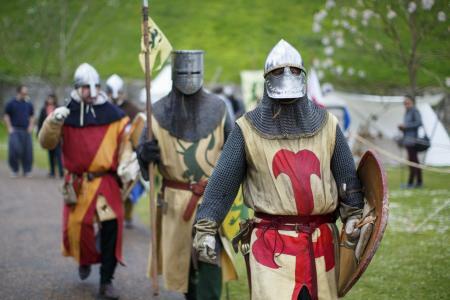 Pretend to be a knight for the day at one of Britain’s most historic castles. Arundel Castle boasts fairytale towers and rooms full of suits of armour, all set in acres of beautiful grounds and gardens with sweeping views over the stunning South Downs. Perfect for keeping curious kids busy exploring all day! 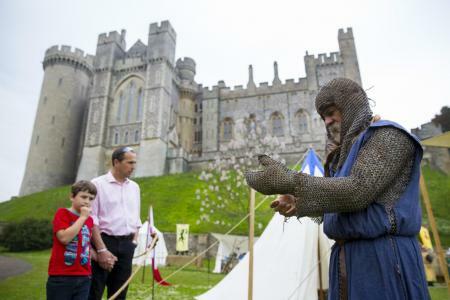 Travel back in time and experience medieval life through re-enactments and artefacts at the beautifully restored Arundel Castle in West Sussex. Dominique Dinse visited with Oliver, 10, and Ben, 9. 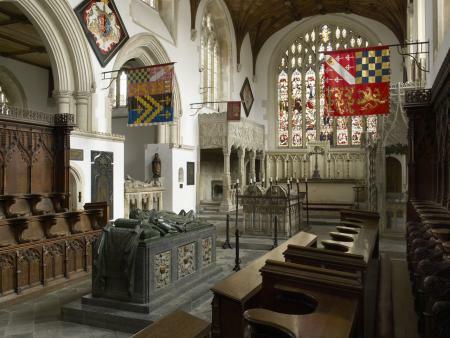 Inhabited to this day by the family of the Duke of Norfolk since the title was conferred in 1483 by Richard III – the king in the car park who was reinterred in 2015 – this spellbinding castle actually dates back nearly 300 years earlier to the end of the 11th century and has, through the centuries, played a key role in the Crusades, the signing of the Magna Carta and the English Civil War. The fully restored castle and stately home is full of amazing artefacts from its colourful history – including the perfectly preserved room where Queen Victoria slept during a stay here in 1846 and even a detonated World War II bomb that now resides in a below-stairs passageway – all shown off in a way designed to bring its history brilliantly to life for inquisitive young minds. Castle staff are understandably protective of the historic artefacts in their care so most of the treasures on show inside the residential part of the castle are guarded by “Please Don’t Touch” signs. However, the keep – the most ancient, defensive part of the building with its crenellated tower and arrow slits which little eyes will immediately recognise as a “proper castle” – is great for hands-on fun. Narrow stairs are just begging to be climbed, there are walls to peep over and a deep, deep well to (safely) peer down. There’s also a recording of an actor’s voice recounting a musketeer’s story and all sorts of props scattered about to marvel at – tiny lifelike mice, realistic log fires and shiny suits of armour. Plus the castle grounds are a tiny tot’s dream – wide, green lawns for romping on, low hedges for playing hide-and-seek behind, and lovely big, shady trees to climb. It’s well worth buying the Young Person’s Guide to Arundel Castle – available in the castle shop for £2.99. As well as the history of the castle, it takes kids on a room-by-room tour, getting them to look for and tick off fascinating features as they go – can you spot the arrow slits, portcullis and flagpole around the stone walls of the keep? What’s the difference between the two shields in the high-ceilinged Barons’ Hall? Can you spot all the patterns pictured in the sumptuous Drawing Room? There are fascinating facts on each page that help make a visit here far more than just a hurried walk through the rooms. The wordsearch and drawing activities should keep kids busy on the way home, too! Older children will be captivated by the detailed description of the castle treasures in the Young Person's Guide, plus the knowledgeable guides in each room really come into their own when bombarded with questions from enthusiastic tweens about the suits of armour on display, the rows and rows of books in the library and daily life in the castle in medieval times. Our 9- and 10-year-old were particularly engrossed in the collection of historic weapons in the Armoury. Here, as in every room, there are laminated information sheets which older kids will find brilliantly handy as they take in the sights. The magnificent Barons’ Hall, with its soaring, vaulted ceilings and stunning stained-glass windows was used as a location in the film The Young Victoria and there are photos on display showing how it looked. The Keep is a must for all ages. With its crenellated tower and tall arrow-slit windows looking out over the town of Arundel and the surrounding countryside, it rewards the hike up 100 or so steep stairs with magnificent views and a real feeling of achievement. And be sure to time your visit for when there’s a historic display in the grounds. On the day we visited there were medieval merchants, a blacksmith and leatherworkers plus falconry and archery displays that let us see medieval life up close and made for one of our most enjoyable days out in ages. 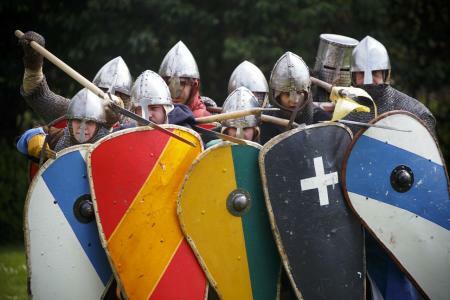 Our family visited on a hugely enjoyable day themed around Normans and Crusaders, with fascinating falconry displays and archery demonstrations by players in full medieval costume. 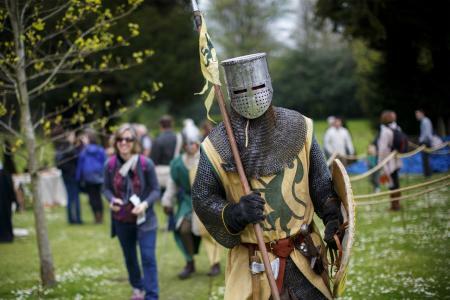 Arundel puts on an amazing array of historical displays all through the year, from castle siege-themed activities during the May half-term to a jousting tournament during the summer holidays. The sweeping grounds are also the perfect backdrop for classic car displays so it’s no surprise that the MG Owners’ Club, Jaguar Enthusiasts’ Club and more use the castle to show off their magnificent vehicles during the year. A full list of events is on the website. There’s a café selling hot and cold drinks, ice creams, cakes and sandwiches and the house speciality, the £2.95 Sussex Porky homemade sausage roll. In the adjoining restaurant you can enjoy larger meals – everything from homemade lasagne for £9.75 or pie of the day for £10.50, to smoked mackerel with horseradish and salad for £8.65. There’s a tasty children’s menu featuring favourites such as chicken goujons or meatballs and spaghetti, for £5.50 each. Charming wooden highchairs are provided for little princes and princesses, and the friendly staff will happily warm up bottles or jars of baby food. Picnics are also welcome in the grounds and on a sunny day it’s a joy to eat your stash of homemade sandwiches under the shady trees against the picture-perfect backdrop of this historic building. By road: Arundel Castle is on the A27, four miles north of Littlehampton and the south coast and midway between Chichester and Worthing. It’s easy to find – plug BN18 9AB into your satnav and follow the brown-and-white tourist road signs. By rail: The castle is an easy ten-minute walk or short taxi ride from Arundel station. There is a frequent service from stations including London Victoria, Brighton, Worthing, Littlehampton, Bognor Regis, Chichester and Portsmouth. Arundel has a tiered pricing system so you pay for as little or as much as you want to see. If you’re visiting with really little children, you might want to just pay to see the Keep, gardens and grounds for which you’ll need a Silver ticket – £9 for children 5-16 years and £11 for adults. To see the entire property, the best value is the Gold Plus ticket, which admits you to all the castle rooms and bedrooms plus the Keep, Fitzalan Chapel, gardens and grounds. For children 5-16 years this is £9, for adults £18. A family Gold Plus pass – for two adults and up to three children – is £45. Opening hours: Arundel Castle is open Tuesdays to Sunday, plus Bank Holiday and August Mondays, spring to autumn. Most of the castle and grounds are open from 10am apart from the castle rooms which open a little later, at noon – an allowance for the Howard family which still lives in the castle. There’s so much to see it’s advisable to allow at least four hours to take it all in. Last admission is 4pm.